SAW FRAME: This is of rigid construction and runs in prismatic guide ensuring a square and parallel cut. This cut takes place on the draw stroke and the blade is hydraulically lifted out of contact with workplace on the forward stroke to prevent wear or the blade and can cut metals of all kinds and strength. FEED: Two levers are provided at the dash pot one regulates the rate of feed while the other enables the bow slide to be raised or forwarded hydraulically bow raised automatically and motor switched off on completion of the cut. BED: The Bed is of large proportion provided with guide ways for the vice for clamping the material. Vice is of rigid construction. One jaw remains fixed and the other can be adjusted according to the materials to be cut. ELECTRICAL EQUIPMENT: A direct on-line push button starter can be fitted which incorporates and adjustable trip mechanism which stops the machine as soon as the blade is clear from the work. Non productive time is reduced a minimum. DRIVE: Power is supplied by a suitable electric motor through Vee-Belt which are full adjustable for tension all drive mechanism being totally enclosed. SPEED: The incorporation of two -speed driving mechanism allows for the most suitable speed to select for material being cut. COOLANT: The coolant tank is totally enclosed in the machine base and a constant Speed Mechanical Pump supplies coolant to the saw blade through a stay put pipe and tap. OPTIONAL ACCESSERIES: Bar Support Stand, Tilling Angular Vice, Hacksaw Blade, Electric Coolant Pump, Electric Motor, Starter, Vie Belts. Bearing 2 Nos. Taper and 3 Nos. Ball - Bearing are fitted in each machine. 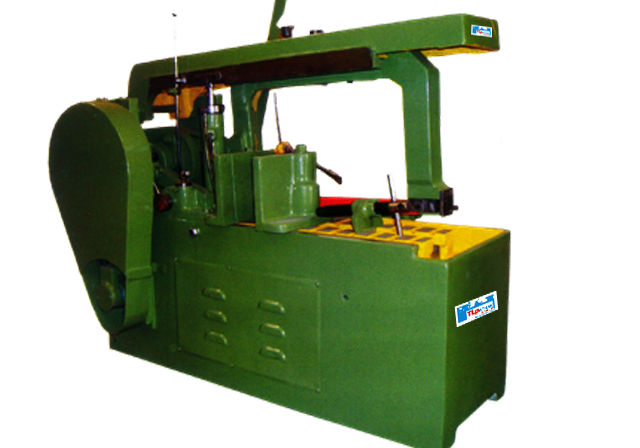 Ø Automatic lift to Bow on Completion of Cutting Cycle and motor switched off automatically. Ø Two speeds and Driven by V. Belt. Ø Cut Metals of all kinds and strength. Ø High output at low initial cost.